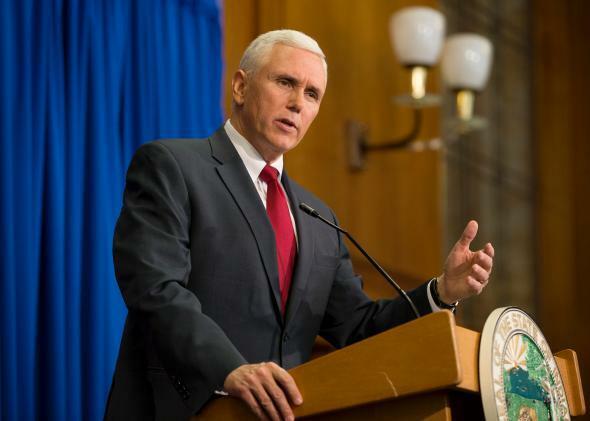 Mike Pence is either lying or deluded about Indiana’s “religious freedom” law. Indiana Gov. Mike Pence at Tuesday’s press conference. On Tuesday, Indiana Gov. Mike Pence delivered a rambling, irate press conference at which he professed to support a new bill that would “clarify” his state’s new “religious liberty” law. That measure, of course, has come under severe criticism for potentially granting businesses a license to discriminate against gays and lesbians based on their owner’s religious prejudices. Following several days of unrelenting, high-profile censure, Pence has decided it wouldn’t hurt to strip the law of its discriminatory power. At the same time, however, he continues to insist that the law, as originally passed, does nothing to permit discrimination and merely mirrors similar measures passed by 19 other states and the federal government. If Pence is not intentionally lying, he is incredibly stupid. His claims are Tuesday were verifiably untrue, nothing more than a stream of blatant falsehoods. The debate over Indiana’s “religious freedom” law isn’t a matter of opinion; it is a question of truth versus fiction. And Pence made clear on Tuesday that he has chosen fiction. Here’s the easily substantiated truth behind the bill. Its supporters explicitly intended it to legalize discrimination against gay people—especially gay couples, who, lately, have faced discrimination from florists, bakers, and photographers who refuse to serve them. To ensure the law achieved this goal, its drafter inserted two monumentally important provisions, neither of which is found in the federal religious freedom law signed by President Bill Clinton. First, the bill explicitly permits for-profit businesses to exercise their religious beliefs, rather than limiting its effects to regular human beings. Second, the bill protects businesses against private lawsuits in addition to state suits. These provisions, taken together, convert the law from a modest civil liberties measure to an altogether different beast. Although the Supreme Court has held that the federal religious liberty law applies to some corporations, the statute itself applies only to people—and, as Justice Ruth Bader Ginsburg pointed out in dissent, extending it to for-profit companies strains the meaning of the text. There’s no such issue with the Indiana law, though: This measure was designed to apply to businesses, like florists who dislike gay people, as a straightforward reading of its text makes clear. But it’s really the next provision that gives the Indiana law its startling and unique breadth. The federal religious freedom law was designed to protect individuals from government overreach, like a state law barring ritual drug use by American Indians. Indiana’s law, on the other hand, lets people (and businesses) cite their religious freedom as a defense in private lawsuits, even when they’re accused of violating a civil rights law. In practice, that means a baker who is required by a nondiscrimination ordinance to serve all customers may cite her religious opposition to homosexuality in order to refuse service to a gay couple. Here, then, is the true license to discriminate: A secular baker is still bound by the law; a Christian baker has a special religious right to kick out customers she dislikes due to her religion. For some reason—ignorance? idiocy?—the right-wing media has lately protested the notion that Indiana’s law permits anti-gay discrimination. This trend is quite strange, since, in the same breath, these writers often argue that such laws are necessary to … protect religious people from having to serve gays. Conservatives should really just pick a lane. We can, and should, argue about whether for-profit businesses deserve a religious right to refuse service to gays. But it’s pointless to waste time arguing about whether Indiana’s law does that. Of course it does; that was the point. And Pence’s mendacity only makes the entire debacle more embarrassing for him and his media allies. Read more of Slate’s coverage of the Indiana Religious Freedom Restoration Act.